The II18MD is the Image Intensifier with an 18mm diameter input screen that can be modulated and is digitally controlled. The II18MD modulated image intensifier is used as key component for FLIM (Fluorescence Lifetime Imaging Microscopy) in the homodyne frequency domain. The II18MD modulated image intensifier is designed for users who wish to apply the highest quality detector as part of their set-up for fluorescence lifetime imaging. The high-resolution modulated image intensifier is mounted on the 1x C-mount camera port of a wide field fluorescence microscope. 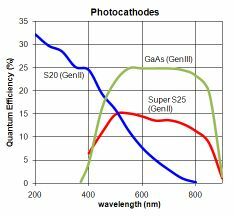 The gain of the image intensifier can be controlled by the voltage across the MCP and is typically in the range of 100 to 10,000 times. Also the voltage between cathode and MCP can be changed in order to control the gain. During modulation, the gain is modulated via the cathode voltage. A CCD camera has to be attached to the output of the II18MD image intensifier, so that the integrated high quality relay lens can transfer the output image onto the CCD of the camera (i.e. lens-coupled intensified CCD camera). This unit contains the high voltage power supply and RF (Radio Frequency) amplifier. The control unit has a low voltage input to receive the external modulation signal that has to be amplified and biased with a variable DC photocathode voltage. Adjusting the MCP voltage controls the image intensifier gain. To prevent damaging, the image intensifier has an overload protection circuit that switches off the image intensifier when the light output becomes too high. Modulation frequencies?up to 120MHz. Instead of using an external modulation signal generator, we offer a built-in modulation signal generator into the integrated control unit/ power supply. This is the II18MDS. Patents owned by Photonic Research Systems Ltd.